Are you interested in teaching your child the Chinese language but don’t have the time for language lessons, or do you lack Chinese resources in your area? eChineseLearning is an online program where kids can learn Chinese online at home with a professional native Chinese tutor specialised in teaching children. I had never actually considered online Chinese lessons for my children as I thought they would be too young. I believe children learn best when spending time with a native speaker, playing together, interacting naturally. However, not all families are fortunate enough to have this option due to many different reasons, so they need to seek other options. Learning a language online is definitely the next best thing. If you have been following Bilingual Kidspot you may know that my children have been learning a bit of Chinese Mandarin. So when eChineseLearning contacted me offering some Chinese lessons, we were more than happy to participate. My five year old is a beginner Chinese speaker. We have used some language apps in the past and watched a few Youtube videos and he has picked up some of the basic words, but this was the first time that he was having a proper formal Chinese lesson. The Chinese lessons were hosted online over Skype with a native Chinese teacher based in China. We were able to choose the time we wanted, which was great as they could be flexible according to our busy schedule. From the first moment the Chinese tutor was interacting with my son he was completely engaged. She started asking him about his interests and what he likes etc, then started to introduce some Chinese vocabulary. He really enjoyed it. The Chinese lessons go for around 30mins for young children, and up to 50 minutes for older children and adults. We all know that children don’t have the attention spans that adults have, so it works out quite well. The teacher was always flexible and said she could work with what we needed. The first lesson was based on introductions and then went on to numbers. The next was family members. 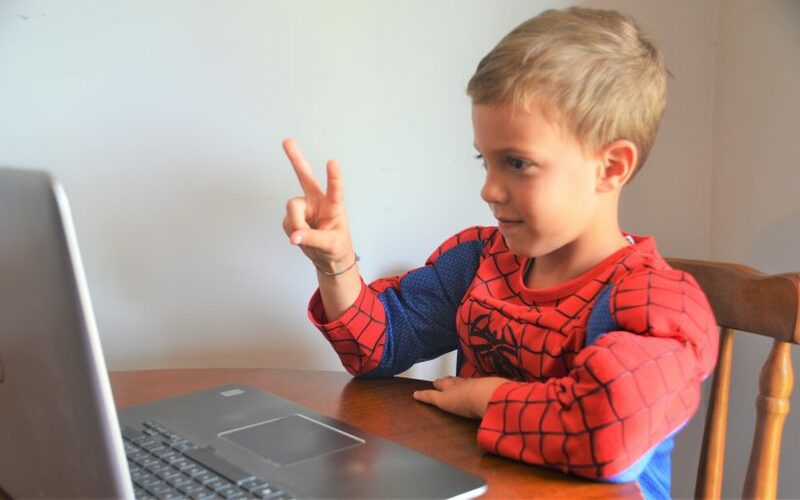 The online Chinese tutor used different methods to engage my son, asking questions, getting him to repeat words and phrases, and asking him copy symbols onto paper. He really enjoyed it and couldn’t wait for the next lesson so that he could learn more Chinese. Native Chinese Teachers: All of eChineseLearning Chinese teachers are native speakers They grew up speaking Mandarin and are entirely fluent with specialised training to teach Chinese to foreigners. They work full time, unlike many other similar programs. That means they are dedicated and professional at what they do. Personal Chinese tutor: Once you sign up for a course, your child will be assigned a personal tutor, who will help them throughout their Chinese learning studies. For all levels of Chinese: Your child can be a complete beginner learner, or a Chinese speaker just needing some extra tutoring. The online Chinese tutors work with your child at their own pace. 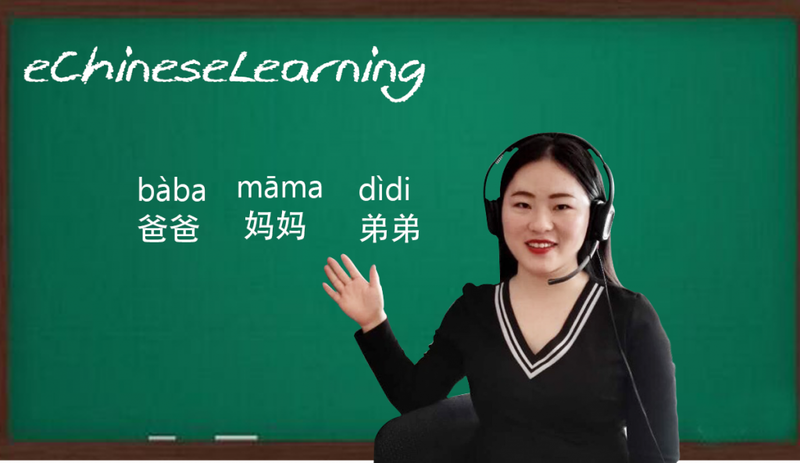 Chinese lessons for all ages: Although we tried the online Chinese lessons for kids, they also offer lessons for adults too. Time Flexibility: Lessons are available over skype 24/7 so you are able to choose a time convenient for you. 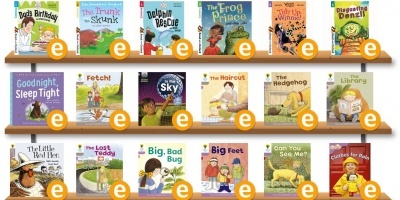 Free Trial Lesson: eChineseLearning offer one FREE TRIAL LESSON before signing up. Once you sign up they also offer a 30-day money back guarantee to make sure you are completely happy with the service. Prices: Since the lessons are one-on-one, the prices are not the lowest, especially when you compare them to some group classes. However, if you look at the quality and results that inevitably come with one-to-one instruction, it’s still a great value for money. Might not be best for children under 4: We know all children are different, so it really depends. 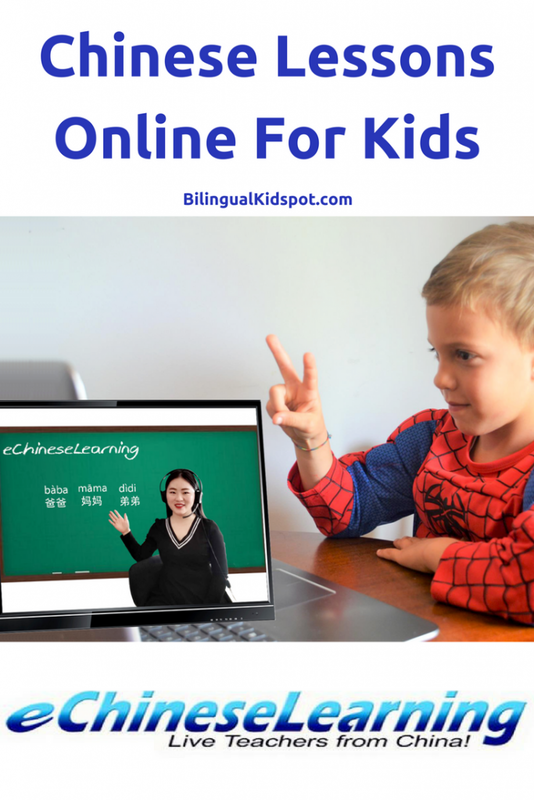 I would recommend the online Chinese lessons for school-aged children and above. My little boy who is almost 4 sat in for a lesson, however he became easily distracted, whereas my older son who is almost 6 was completely engaged and enjoyed it. Although we have had just a few lessons, it has been a great experience and I highly recommend eChineseLearning lessons to families with children who want to learn Chinese. I think they could also be great for adults too. For parents who are interested, I suggest you start by signing up for a FREE TRIAL at their website. This trial lesson gives you a chance to see how your kids react and if you would like to continue, no strings attached. This way you really have nothing to lose. 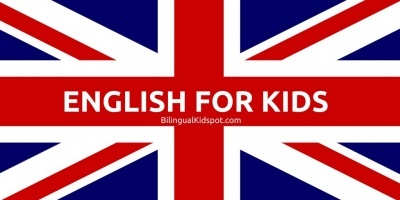 And, if you use the code Bilingual Kidspot when you subscribe to a lesson package, you will get one week of extra lessons for FREE. 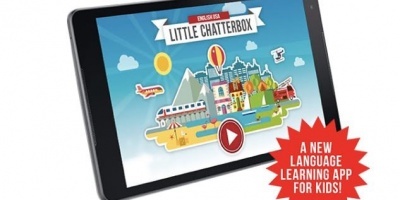 You can find more information about online Chinese lessons for kids with eChineseLearning here on their website. It has never been a better time for kids to learn Chinese! wow! good blog, awesome way to learn a Chinese for the kids and it is not only for the kids but also for all age group people. thanks for the post. I have been studied with eChineseLearning for six months for my HSK test. My teacher Helena is always very patient to teach me Chinese, and I will do HSK exercises after each class. She helped me pass my HSK Level 5, I am very grateful to her! I can’t agree with you more about learning Chinese online and raising kids bilingual. I am a Chinese mom and we live in the US. I did a lot of research and also try to keep my kids talking with me in Chinese. Online learning is a very powerful way for sure!